At the ambitious, tuition-free private school, he received targeted speech support, and at home his mother practiced speech with him. A year and half later, he’s happy and proud of where he goes to school — and when he speaks, his mother can understand 90 percent of what he says. “I can have a conversation with my son now,” the mother of four said. Julian is one of 243 children from East Palo Alto and Menlo Park’s Belle Haven neighborhood enrolled at The Primary School, which is in its third year of operations. The O’Connor Street school has made waves for both its vision — which strives to integrate education and health care to better serve low-income children and families — and its famous founder, Priscilla Chan, a pediatrician and the wife of Facebook CEO Mark Zuckerberg. Chan chose to launch this model in a community that has historically struggled to provide high-quality education and where families are battling poverty, housing unaffordability, food insecurity, violence, immigration fears and other pressures. The Primary School seeks to address this “toxic stress” on young children and their ability to learn and engage at school. “Existing education, health and social support systems are not set up to help the children most likely to experience trauma, which often goes untreated,” Chan and Meredith Liu, co-founder and chief design officer of The Primary School, wrote in an opinion piece for CNN in 2017. At a glance, The Primary School looks like any other elementary school: reading corners in classrooms, drawings tacked to walls, swings and play structures outside. But its structure is dramatically different. The school will admit children at or even before birth: Administrators make a concerted effort to recruit families in high need who might be unaware the school even exists. The school then provides services to parents during those early years and starts students full time at age 3, given that the majority of brain development happens in the first five years of life. DiCarlo’s family had access to parent groups, school-readiness sessions and other programs before Julian started preschool in 2017. Parents are deeply engaged with the school and are assigned coaches to make sure not only the students’ but also the families’ needs are met. Through the relationships the coaches develop with families, the school gains a holistic view of what’s going on in a child’s life. For example, a 3-year-old girl was arriving late at school due to instability at home, so the school helped the family find more stable housing, said Primary School CEO Courtney Garcia, who was hired last August. “We get to think through the eyes of a child and the eyes of a family around what their experience can and should be in a school environment,” said Zoe Duskin, who was hired as The Primary School’s new principal last May. “That opportunity to think beyond the conventional boundaries of what counts as school or what counts as pediatrics is just incredibly exciting work for me as an educator,” Duskin said. Through that effort, DiCarlo felt the school “let our voices (as parents) to be heard,” rather than acting like well-financed outsiders who were telling the community what it needed — a familiar refrain for East Palo Alto. It’s a grassroots-level approach that may have come out of Chan and Zuckerberg’s prior effort to radically change the education landscape: Their $100 million donation to reform public schools in Newark, New Jersey in 2010 was later criticized as a failed top-down initiative. Families can apply to The Primary School, but the school also actively recruits families, particularly through the Ravenswood Family Health Center. The school has a waitlist and admits students on a lottery basis when there aren’t enough spaces available. Just before the holidays, The Primary School students were in the midst of a health unit. In each classroom, students had transformed play areas into miniature dentist offices and hospital waiting rooms, hung hand-drawn posters on the walls classifying healthy and unhealthy foods and went on a field trip to the Ravenswood Family Health Center — all evidence of the school’s effort to rethink primary care by making it a natural part of the school experience. Last fall, the school focused on teeth and gum care because “poor oral health has a huge impact on a child’s ability to attend and focus in school, and it is entirely preventable through basic everyday behavior changes,” the school’s 2017-18 annual report states. The school hosted a community night with dental practitioners and asked parents to set an oral health goal, such as cutting down on sugary snacks or brushing a child’s teeth twice a day. Students learned good tooth-brushing techniques in class and received free dental services from registered dental hygienists from Ravenswood Family Health Center who visit the school bimonthly to offer X-rays, cleaning and fluoride treatment, all optional services. This also means parents typically don’t have to miss work to take children to appointments, unless a child is referred out to a clinic for extra care, like filling a cavity. 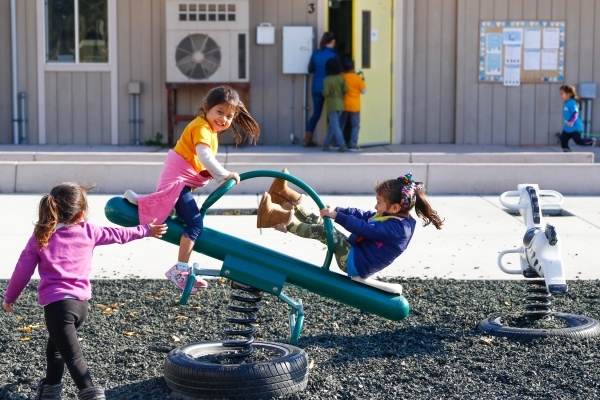 Asthma is the most common physical health problem among students at The Primary School and children in East Palo Alto more broadly, said Ravenswood Family Health Center pediatric nurse Sandra Nova, who works as a liaison between the clinic and school. Left untreated, asthma can affect a child’s wellness and lead to absenteeism. As such, The Primary School provides all students with monthly screenings, trains teachers to look for early symptoms and develops individualized action plans with affected students and their families. The action plans identify a student’s asthma triggers, medications he or she is on and steps to take if he or she has an attack. “Rather than having a big behavior or a big emotion happen in the classroom and respond immediately with rewards or punishment, we instead want to come from an understanding of where a child is in their brain state and help them calm down and re-regulate,” she said. Through the narrative of “Shubert’s Helpful Day” — the main character is a bug who decides he’ll be helpful to his peers no matter how they act — the class talked about naming emotions like anger and sadness. Before they could leave story time for a mid-morning snack, they had to answer questions like what to do to help their classmates feel safe or what to do if they feel angry during class. Suggestions from the 4-year-olds ranged from taking a deep breath to going to a safe space in the classroom (a pillow-filled corner with soft lighting). Similarly, pediatricians become frustrated with the limitations they have in supporting young patients in need, only seeing them as newborns or when they’re sick — unable to know how symptoms might be manifesting at school. Nova said she sees The Primary School as leveling the playing field for children who would otherwise start school at a disadvantage that would affect their life trajectories. The Primary School’s parent coaches are perhaps the most unusual aspect of The Primary School model. The DiCarlos’ coach, Cristina Matthews, connected the family to housing, food and financial support resources, helping them fill out applications and navigate confusing bureaucracies. She reminded DiCarlo and her husband to attend school events and increased their participation in their son’s education. “I know how it feels to have homework and then you don’t have the support at home because of either the language barrier or whatever it might be. I know how it feels going in the next day with your homework not completed — not because you didn’t want to do it but (because) you need help and you didn’t have that support at home,” she said. It’s hard not to be skeptical that what this privately funded school is working toward could be replicated within a conventional public school setting. But The Primary School leadership, many of whom came from public education, believe it’s possible. Duskin, who was previously the founding principal of a public charter school in Washington, D.C., said replicating The Primary School model is not impossible, but “does require some transformation in how we think about the work of a school,” particularly on the part of teachers and administrators to be open and responsive to feedback from parents and partner organizations. “There’s some humility there that’s required for us as educators, but it’s also where I think the work is becoming really interesting and promising,” she said.